This evening I spent some time talking to Andrew Anagnost, Autodesk VP of Suites, Web Services and Subscription and Noah Cole from PR about Autodesk’s strategy for the cloud. Andrew wanted to let me know about where Autodesk is today with cloud computing and where it is headed. For quite some time now Autodesk has been releasing some cool cloud based technologies on Autodesk Labs. This September they put them all together into one basket and called it Autodesk Cloud. Andrew wanted make it clear that Autodesk is not trying to replace desktop applications and move everything to the cloud. Instead Autodesk’s cloud strategy is to use the cloud for what it is good for. The desktop versions of the applications will always be available for whoever wants to use them. Andrew believes that in three years Autodesk will have online versions of all its major applications. They already have a online version of AutoCAD LT running today. I asked Andrew about the geographic limitation of the AutoCAD LT online trial. I can’t run the online trial from here in India. He replied that currently they were using Amazon servers in the US and Singapore. But pretty soon the Autodesk Cloud is going to spread world wide and the geographical limitation is going to go away. Free Autodesk Cloud accounts come with 1 GB of storage space. Whereas customers on subscription get 3 GB of space, although Andrew admitted that Autodesk is not actually enforcing the 3GB limit since they are looking to see how users use the services. 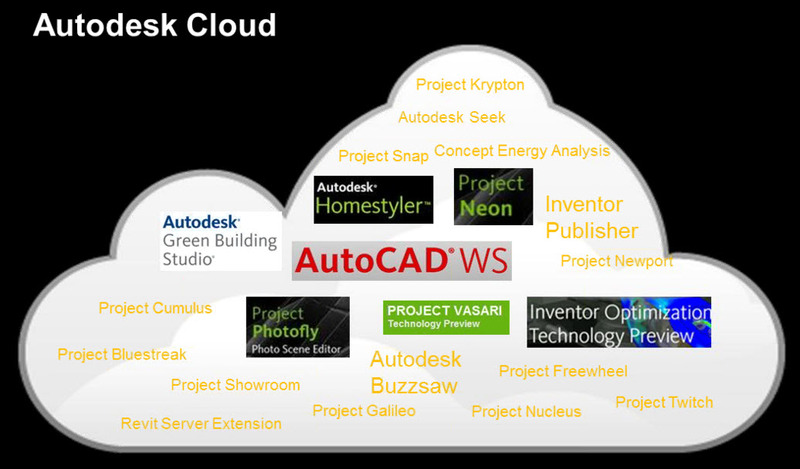 The slide below shows how the Autodesk Cloud capabilities are spread out. Sharing, viewing and DWG editing (basic) are free for everyone. Then depending on what suite you purchase you get a specific number of cloud units of capabilities related to your suite. A cloud unit is something that Autodesk uses to quantify cloud computing resources. For example, a rendering equals two cloud units. An optimization equals five. According to Andrew, Autodesk has set it up in a such a way that 80% of users will not cross the limits. The other 20% will be heavy users and will need to pay extra for more cloud units. 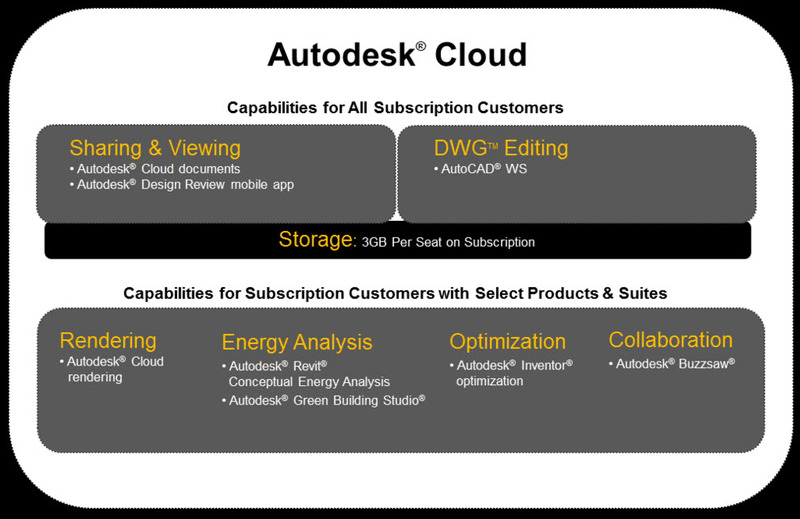 So by Autodesk’s estimates the Autodesk Cloud will come free for 80% of subscription customers as a value addition. 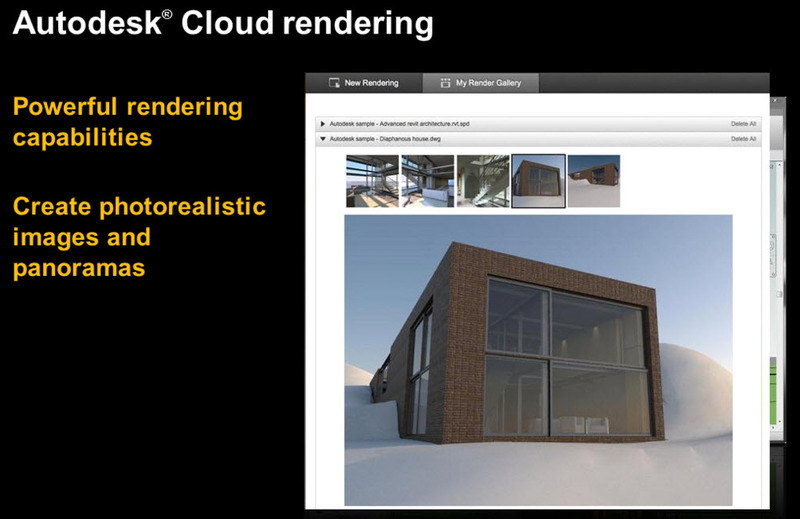 According to Andrew, the most popular Autodesk Cloud application is rendering. 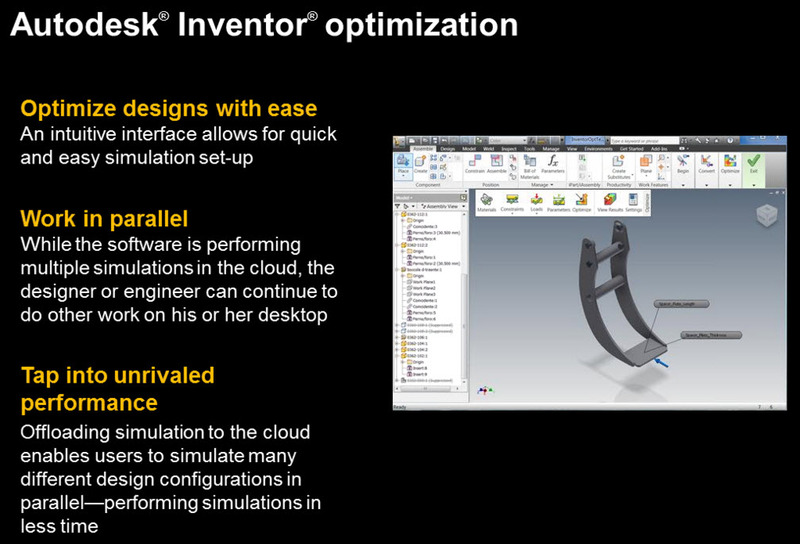 Next comes Autodesk Inventor Optimization. “This stuff is not experimental anymore“, Andrew asserted. “People are using these cloud applications in real projects“. Autodesk uses Amazon Web Services and Citrix for their cloud infrastructure. Andrew was particularly pleased with the server side encryption that Amazon recently added. “This adds a another level of security for our customer’s data“, he said. Visit www.autodesk.com/cloud for more information.